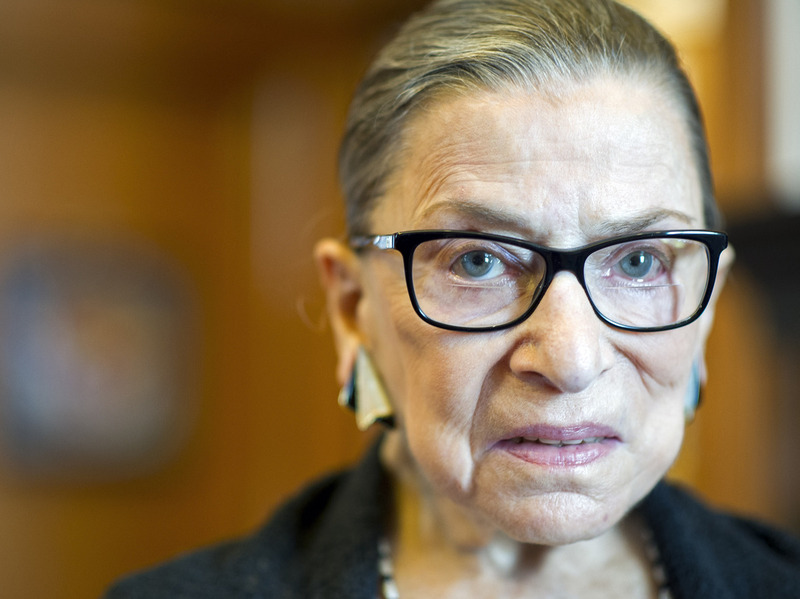 Justice Ginsburg Revises Texas Voter ID Dissent, Then Announces It : It's All Politics The U.S. Supreme Court is correcting its own record. That's not exactly rare, but Ruth Bader Ginsburg is the first justice to call the public's attention to her own mistake. In her revised dissent, Justice Ruth Bader Ginsburg clarified that photo ID cards issued by the Veterans' Affairs are "an acceptable form of photo identification for voting in Texas." Once again the U.S. Supreme Court is correcting its own record, but Wednesday marks the first time that the court has called attention to its own mistake with a public announcement. And it was the erring justice herself, Ruth Bader Ginsburg, who asked the court's public information office to announce the error. Last Friday Ginsburg pulled an all-nighter to write a dissent from the court's decision to allow the Texas voter ID law to go into effect while the case is on appeal. The dissent, released Saturday at 5 a.m. and joined by Justices Sonia Sotomayor and Elena Kagan, listed a variety of photo ID forms not accepted for purposes of voting under the Texas law. Among those listed in the Ginsburg dissent as unacceptable was a U.S. Department of Veterans Affairs photo ID. Three days after the opinion was released, professor Richard Hasen of the University of California, Irvine said on his election law blog that the state does in fact accept the Veterans Affairs IDs. Upon confirmation of that fact by the Texas secretary of state's office, Ginsburg amended her opinion. Not surprising. What was surprising is that, according to Supreme Court spokeswoman Kathy Arberg, Justice Ginsburg instructed the press office to announce that the opinion had "contained an error" and that it was being corrected. On Wednesday, the court announced the mistake and the correction. Errors of this sort are not exactly rare. In this case, it appears that Ginsburg may have gotten the Wisconsin and Texas voter ID provisions, both before the court, mixed up. Until the era of the blogosphere, however, this sort of mistake was the stuff of academic gossip. Now it is the stuff of academic blogs, which sometimes get picked up in the popular press. A more embarrassing mistake by Justice Antonin Scalia was caught by Harvard Law professor Richard Lazarus last spring; the error was quickly fixed, but it was not announced. Nor was another error made and corrected by Justice Kagan. Ginsburg is the first justice to call the public's attention to her own mistake.